It’s no secret that shaving with a fresh razor blade feels great. But razor prices are so high people try to make their blades last for weeks at a time. Doing so causes cuts, skin irritation, and generally painful shaves. But with Dollar Shave Club you can always get a smooth shave with a fresh razor because they deliver to you monthly for as little as $3, shipping included. Each plan includes a free handle in the first shipment, and replacement blades are shipped each subsequent month. If you don’t shave very often you can switch to the “Not So Hairy” plan which ships every other month. Plus, you can easily change your razor type or cancel anytime. And they have popular extras including Dr. Carver’s Easy Shave Butter and Post Shave Moisturizer, as well as One Wipe Charlies, the peppermint buttwipes for men. Contrary to popular belief, shaving should never hurt. 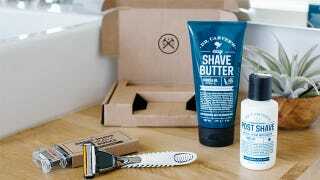 Try Dollar Shave Club and pay as little as $3 per month, shipping included.